Do You Make This Mistake at the Dinner Table? So let your child know that you are in charge of what is served but that it’s up to them whether or not to eat. This no-pressure atmosphere increases the likelihood that kids will eat a wider variety of foods. 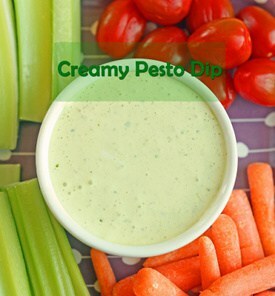 Serve raw veggies with a fun dip, like ranch dressing, raspberry vinaigrette, or a creamy pesto dip. Cut veggies into fun shapes with small cookie cutters. Here’s a 5-pack of fun veggie cutters. Until I looked, I didn’t even know that was a thing! Dress veggies up by melting some mozzarella or Parmesan cheese on top. Smoothies, smoothies, smoothies. You can make a pretty tasty smoothie with green stuff, even! And your kids will love throwing the food in and holding down the button to pulverize it all. But first, a warning: We’ve gone through a lot of blenders – even had one catch on fire – and you need a high-quality blender if you’re going to make smoothies regularly. Our favorite (and still going strong after three years): the Ninja. We love our Ninja! You can find lots more ideas here. No one likes to spend the time making a nice dinner, only to scrape half of it off plates and into the trash after dinner. But somehow, it seems just as wasteful to put food into a body that doesn’t need it – the body just converts it to fat that then has to be worked off. Well, as it turns out, forcing your kid to eat more won’t solve the issue of world hunger. How to Fix It: Let your kid dish up her own dinner. Save their leftover dinner and pack it in their lunch the next day. If they don’t finish their dinner and you suspect they may get hungry again before bedtime, put their plate in the fridge. 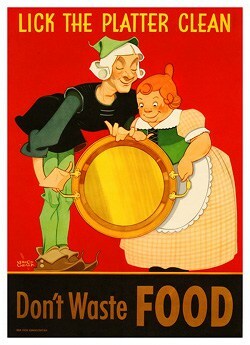 Then if they want more food before bed, pull out the plate and reheat it. For fun, serve a meal in a muffin tin once in a while. If you’re stressed that your kid isn’t getting enough food, check out this chart of how many calories your kid needs. For example, a moderately active 8-year-old needs only 1,400 to 1,600 calories a day. How to Fix It: Relax. I’m not always great at watching the clock when we get home from school, so I’ve been known to let Abby snack up until 30 minutes before dinner. Then when it comes time to sit down to dinner, she says she’s not hungry. Duh. At which point we enter into a power struggle because I know if she doesn’t eat dinner now, she’ll be hungry again before bedtime. How to Fix It: Come up with a snack and meal schedule. We use this super cute notepad to plan out our meal schedule every week. Most toddlers and preschoolers need three full meals and two snacks – one in the morning and one in the afternoon. If they’re going through a growth spurt, they may need more. School-aged children can get by with just one snack in the afternoon – provided breakfast and lunch aren’t too far apart. Pay attention to your child’s appetite and create a schedule that works for her. But remember to be flexible for growth spurts. Banning snacks worked for this family. While I’m not taking a hard line against all snacking, I am going to stop giving snacks so close to dinnertime. The tip from #3 about saving their dinner plate in the fridge in case they get hungry again could help in this situation too. 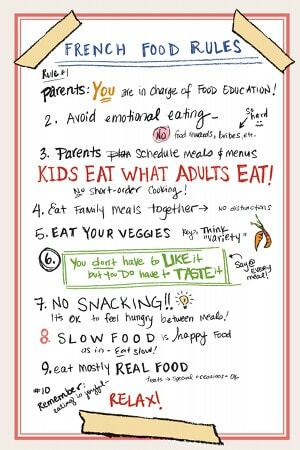 In what situations do you find yourself pressuring your kids to eat more? Have you tried to break the habit? Share your experience in a comment below. MaryJo, I agree that’s definitely a challenge! My 5-year-old struggles with that too. One thing that has worked for us (though not every time, haha) is approaching a meal out as family style. We’ll order 2-3 different entrees, then everyone tries a little of everything, and you can have more of what you like best. But…sometimes she just doesn’t like anything we order! I’d also love to hear other ideas for how to handle this special kind of eating out! I have the opposite problem where usually I have to convince my kid to stop eating haha. But yes there are times when I have encouraged him to finish his food even though I know this is wrong. Usually it’s from shock that he didn’t finish, sort of like, “are you sure you don’t just want to finish your bowl?” Or like most recently, to make sure that he gets enough to eat. Nina, that is a good problem to have! My girl’s appetite waxes and wanes – I can only guess it’s related to growth spurts? Unless your child has a underlying medical condition, DOR works for big eaters as well as limited eaters. It is all about trusting your child to eat what they need and letting them become aware of their own hunger/satiety cues. Thank you for your hard work and research for this post! I’m definitely going to try these tips at meal times. One thing that has helped me is serving my toddler and preschooler their meals on kids sized plates and bowls, then I usually don’t give them much. I love your tip about using kid-sized plates and bowls to help with portion sizes. I’d love to add that above – emailing you now! Emma, isn’t that funny how those aversions stay with us all our lives? Wow! I love your approach of asking “have you had enough?” We’ve been trying to ask Abby if she feels full instead of nudging her to eat more. Such a hard habit to break! I think I mainly get away with the question because sometimes he just gets distracted and I’m never sure if he is finished or not, rather than being fussy. There’d be hell to pay if I removed a plate before he’d finished. But it’s quite a good way to turn round the conversation and let them choose. I am still working on finding a balance between letting my daughter choose when to stop eating and when to help her eat healthy before reaching for a treat instead of dinner. Great post! Katie, I hear you! I feel like I am constantly having to catch myself. Sandie, I totally agree that we shouldn’t preface new foods with a disclaimer, but even if you disagreed with that point, it is rude to insult something that someone obviously put so much thought into — and the post still has many other good points. It surprises me to hear another person who works with children speak so harshly to another adult… words sting just the same online as they do in person. You know, I think this is one of the best suggestions here, as well as a good summary of the article’s ideas. Don’t make a big deal out of new foods. Serve proper portions. Don’t offer garbage food; as a snack, reward, or otherwise. And keep snacking in check. Its really not that difficult to do or understand. yes yes yes YES AND YES!!!!! Well, finally something that makes perfect sense. I am a grandmother and an aunt who has fed a lot of children in my home. I believe every word you are saying about adults giving children preconceived ideas about what they might and might not like. As someone who is currently fighting in recovery from an eating disorder of twenty years, I appreciate that someone is getting out there that we should not make children clean their plates and should change some of these other long held traditional food rules! Thanks! It sounds like you’ve found an approach that works well for your son already, but I’m happy you found the list of ideas useful as well! As a teacher/mom with my degree in both early childhood education and educational psychology I thoroughly agree with you. Kids can control very little in this world but what they eat is one of those things. Making a mountain out of a molehill turns meals into a battlefield instead of a peaceful place to regroup and discuss our day. Great post! I disagree. I will teach my children to respect me by respecting them (and their decisions). Great post! Thank you for the tips – I have found that when I give my kids a “platter” style meal (with a mixture of things, sweet and savoury), they don’t even ask for pudding or a ‘treat’ afterwards, so the ‘whole meal’ approach works with them. I actually received all of these same tips from a registered dietician regarding my son. I’m far more inclined to believe what they have to say (as well as the author of this article who has echoed exactly what I was told). I’m glad your child is flourishing right now but it is possible that she could have an unhealthy relationship with food later on due to the pressure to eat everything on her plate. Both of my parents as well as myself have unhealthy relationships with food due to that rule. You could go by the expert on your child: your child. They should be able to eat just like you and I do: when and how we want to. That makes a lot of sense I have a 2 year old son and he will go 2 or 3 days without eating hardly anything. He will take a bite or two then he will walk away but every couple days he will sit down and really eat.